What is a Linear Power Supply? Linear power supplies are designed for low noise and are often considered quiet since there is no high-frequency switching. They are used anywhere that excellent regulation and/or low ripple is required as well as needing low electromagnetic emissions and excellent transient response. Linear power supplies can only step−down an input voltage to produce a lower output voltage. A linear power supply typically uses a large transformer to drop voltage from an AC line to a much lower AC voltage, and then uses a series of rectifier circuitry and filtering process to produce a very clean DC voltage. The disadvantages are weight, size, and low efficiency. 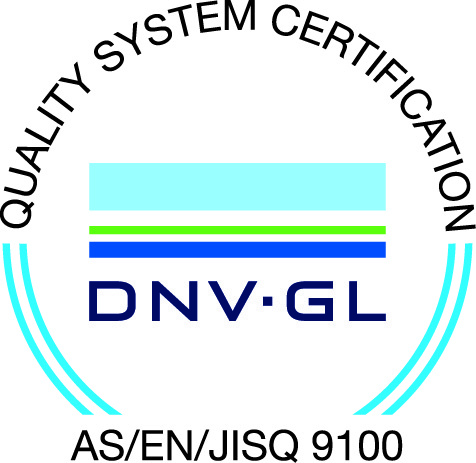 Some examples of application that may require a linear power supply are communication equipment; medical equipment, low noise amplifiers; signal processing; data acquisition including sensors, multiplexers, A/D converters, sample & hold circuits, automatic test equipment; laboratory test equipment; control circuits; computer and industrial applications. What is a Switching Power Supply? Switching power supplies are designed for high efficiency and small size. They incorporate a switching regulator to convert electrical power efficiently. Switching DC power supplies regulate the output voltage through a process called pulse width modulation (PWM). Using a PWM allows various topologies to be used such as buck, boost, forward converter, half bridge rectifier, or flyback depending on the output power requirements. The PWM process generates some high frequency noise, but enables the switching power supplies to be built with very high power efficiency and a small form factor. With a good design, a switching power supply can have excellent load and line regulation. They can either step-up or step-down the input voltage to get the desired output voltage. A switching power supply has greater efficiency than linear regulators because the switching transistor dissipates little power when acting as a switch. However, this switching can generate noise which can be lowered by filtering. If your equipment is for international use, switching technology works almost anywhere in the world whereas a linear power supply must be manually adjusted to work with a foreign grid. Other examples of applications that prefer a switching power supply are general purpose ones used in R&D, manufacturing, and testing, high power / high current applications, some communication systems, mobile stations, some network equipment, electroplating, anodizing, electroforming, electrophoresis, electrolysis, waste treatment, hydrogen generator, fuel cell applications, DC motors, aviation, and shipboard/boat applications. In today’s electronics, switching power supplies are typically preferred due to cost, size, and efficiency. 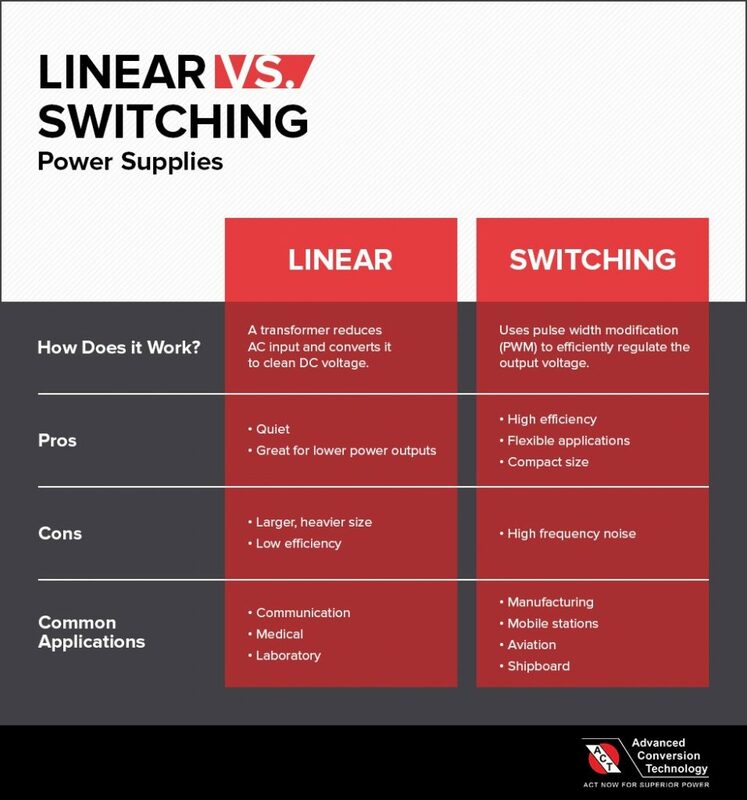 Deciding to use a linear or switching power supply depends on the application and overall system requirements. Over the years, ACT has designed and manufactured both type of power supplies that meet various requirements. Examples of linear power supplies we’ve done are Product # 1446 and Product #2205. Example of switching power supplies are Product # SW2512001-54 and Product # SW2511001-28. To see how we can help you meet your specifications, contact ACT today.